The second set of giant Olympic Rings in Scotland have been launched on The Mound in Edinburgh. The Rings further show how Scotland is ready to welcome the world to the UK next month. 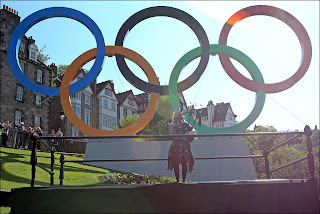 The Rings measure 18 metres by 8 metres and are made of aluminium and are coloured blue, yellow, black, green and red - representing the union of the five continents and the meeting of athletes from throughout the world at the Olympic Games. They have a silver reverse and weigh approximately 3,100kg. The Rings spectacular has been installed in time for Edinburgh’s celebrations when the London 2012 Olympic Torch Relay – presented by Coca-Cola, Lloyds TSB and Samsung - visits the city today and tomorrow. The Rings will officially be launched at a special event taking place at the National Gallery. In attendance will be Allan Wells MBE, a former Scottish athlete and 100 metres champion at the Moscow 1980 Olympic Games, who will be interviewed before running with the Torch tomorrow. The event will be hosted by BBC Scotland presenter Cat Cubie and will have guest appearances from The Right Honourable Michael Moore MP Secretary of State for Scotland, Shona Robison MSP, Minister for Commonwealth Games and Sport, The Right Honourable Donald Wilson Lord Provost of Edinburgh and LOCOG CEO Paul Deighton. Entertainment will be provided by local Inspire Mark projects, as well as traditional Clarsach and Bagpipe music. The Secretary of State for Scotland Michael Moore said: ‘From the moment the Olympic Torch arrived in Scotland the reception it has received has been fantastic. In every village, town and city we have seen people lining the streets and really embracing the Olympic spirit and it keeps growing day by day. The London 2012 Olympic Games will run for 16 days between July 27 and August 12, however the Olympic Football Tournament begins on July 25, two days before the official Games opening ceremony. Edinburgh is welcoming the Olympic Flame on June 13 and 14, 2012. The Olympic Flame will be carried along the route by inspirational Torchbearers and Edinburgh’s citizens are being encouraged to turn out to cheer them on in what will be an historic day for the city. To enable everyone in Edinburgh to share in the excitement, details of all the streets along which the London 2012 Olympic Torch Relay will travel and proposed start times can be viewed in full athttp://www.london2012.com/olympictorchrelay. Coca-Cola is helping the London Organising Committee of the Olympic and Paralympic Games (LOCOG) and host Local Authorities, including the City of Edinburgh Council, to bring music and celebration to every corner of the UK with 66 nights of celebrations during the Olympic Torch Relay. Brit Award winning Scot Emeli Sandé will lead the celebrations at the live, free-ticketed event at Edinburgh Castle on June 13. There will also be a range of exciting entertainment on offer as part of Edinburgh's London 2012 Cultural Programme and the London 2012 Festival. The programme will feature a variety of events encompassing dance, music, theatre and visual art. For more information visit http://www.london2012.com/festival.